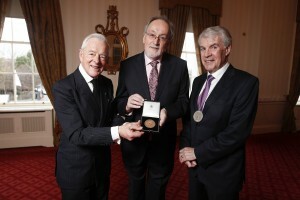 Professor Tony Fagan with the Parsons Medal awarded by the Irish Academy of Engineering. Picture Conor McCabe Photography. Congratulations to Professor Tony Fagan, CONNECT Investigator at UCD, who has been awarded the Irish Academy of Engineering Parsons Medal for Engineering Sciences. CONNECT’s Professor Peter Kennedy, Professor of Electrical and Electronic Engineering at UCC is a previous winner of this prestigious award. The Parsons Medal commemorates the work of Sir Charles Algernon Parsons, the inventor of steam turbine and youngest son of the famous astronomer, William Parsons, 3rd Earl of Rosse whose family seat is at Birr, Co. Offaly. RTÉ’s news report of Professor Fagan’s win can be found here. Earl of Rosse (left) and Eoin O’Driscoll, President, The Irish Academy of Engineering, present Prof. Tony Fagan (centre) with the Parsons Medal. Conor McCabe Photography.